Tony's Talking Pictures Blog: New in Theaters Friday October 12, 2019 "Goosebumps 2," "Bad Times at the El Royale" and "First Man"
New in Theaters Friday October 12, 2019 "Goosebumps 2," "Bad Times at the El Royale" and "First Man"
In the film, two friends find a book of magic that brings a ventriloquist dummy to life to cause havoc on Halloween. “Goosebumps 2: Haunted Halloween” is at very first a kid's halloween film. It offers up a lot of silly fun, but the movie lacks the charm and flavor of the first movie, due mostly to the fact that Jack Black doesn't appear until the final scenes of the film. Black is heard throughout the film as the voice of “Slappy,” the dummy, but his on-screen presence was desperately needed to boost the film up from the mundane. All in all, “Goosebumps 2” is only OK and will please the younger kids looking for a Halloween treat. The film gets a C and is rated PG. In the film, seven strangers converge on a run-down hotel in Lake Tahoe and discover all is not what it seems. 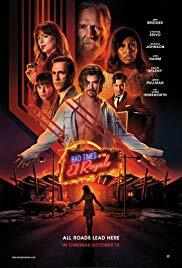 “Bad Times at the El Royale” is a mediocre and unoriginal film with good performances. The cast including Jeff Bridges, John Hamm, Dakota and Cynthia Erivo all do a terrific job. It is the script that lets everyone down, as "Bad Times" is nothing more than a Quentin Tarantino rip off. The film follows the same story, nearly scene for scene as Tarantino's “Hateful 8,” as strangers descend upon a hotel in the rain and each has a backstory that intersects somehow with everyone else's story. The movie even uses 'scene placards' to identify each new chapter in the film. In the final reel, there is nothing about “Bad Times at the El Royale” that we haven't seen before. “Bad Times at the El Royale” gets a D and is rated R.
“First Man” is a dramatic biopic focusing on the life of astronaut Neil Armstrong and his path to be the first man on the moon. The film is almost a cold read into the life of Neil and Janet Armstrong, as we discover how they deal with the emotional ups and downs of their marriage. All of those issues make for wonderful plot devices, and yet the film has no vibrant colors. It is a joyless and stark presentation of Neil's Gemini and Apollo missions that ultimately took America to the moon. Other movies surrounding the space race have approached the subject and have been technically and historically accurate, and yet gave the audience some kind of exhilaration in the process. Films like “Apollo 13,” “The Right Stuff” and recently “Hidden Figures” have told their stories and yet still connected with the audience. 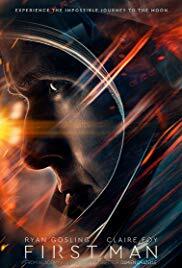 “First Man” is like attending a lecture on Neil Armstrong. Even the climax scene of Armstrong stepping onto the moon is un-engaging and dry. In the end, “First Man” holds it's main character at arm's length making Neil Armstrong as distant as the moon itself.